Hate sending raw URLs to your friends? We do too! Want a way to quickly get back to stuff that matters to you? Wish there was a way to share web pages via email as effortlessly and powerfully as you can on social media? Stop emailing ugly URLs and start doing something better. Welcome to Clip Better. 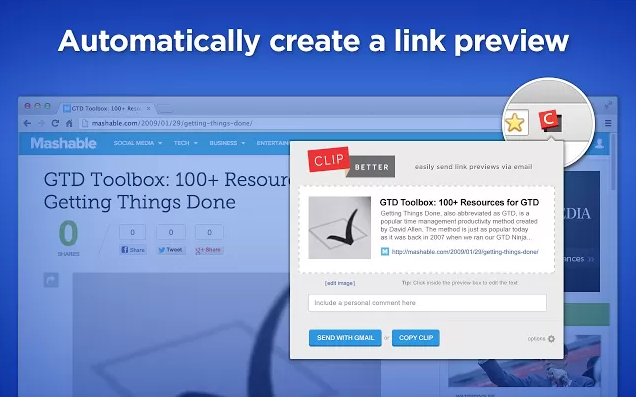 Clip Better will create a rich snippet that includes an image, title, summary, link, and more so that you can quickly share web content with friends and know that they can review a rich preview of the content that you are sharing before they click on the link. There are four different ways you can use Clip Better. Find the method below that is right for you. If you are using the Chrome web browser on your laptop or desktop, the quickest and easiest way to get going is to use the Chrome Extension. You can get this installed in about 15 seconds and you'll be creating your own rich web clips in no time. Head over to the Chrome Web Store to check out Clip Better's Extension. If you aren't using Chrome, but want to learn more, you can find out more here. With a few taps, you can email rich web site previews directly from your iPhone. This app was designed specifically with the smaller screen real estate of the iPhone in mind. Download it for free from iTunes. You can install a bookmarklet in your laptop or desktop without having to install any extensions. The bookmarklet will work on your desktop or laptop in Chrome, Firefox, Safari, Internet Explorer and more. Head over here to quickly install it. For extra instructions and assistance, check out the articles here. Don't want to install anything and just want to get started? We understand. Shoot an email that contains the URL you want converted to clipme@clipbetter.com and you'll get an email back in a few minutes. You can even send multiple URLs in and automatically add your comments. Find instructions here.